Darcy has some really exciting events planned. Read more about it on her column below. 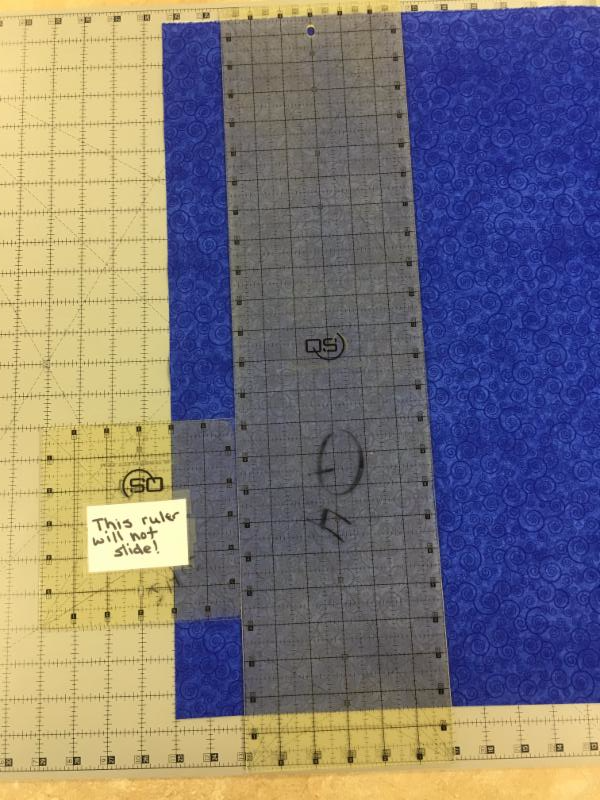 Jean has great tips on how to prepare your backing for the longarmer. 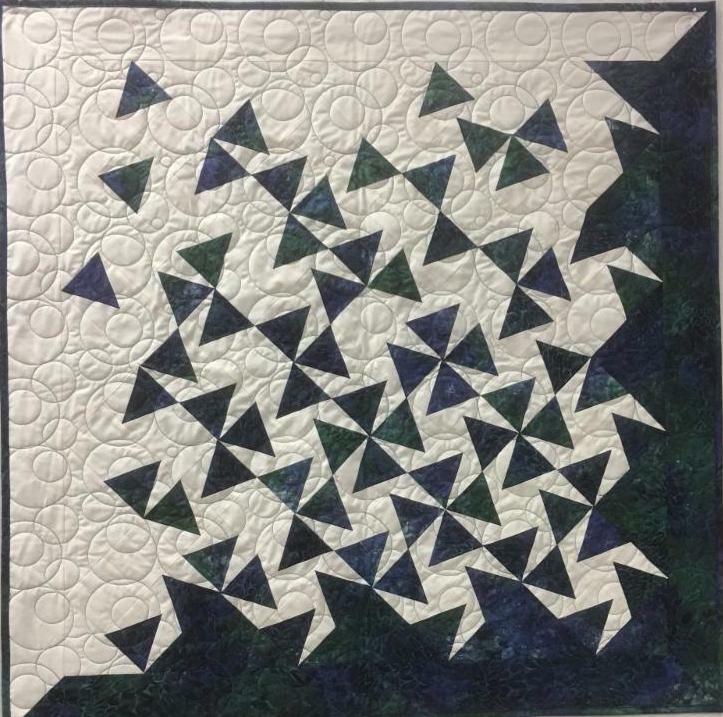 I've set up a Saturday class for "Tumbling Triangles" on March 11. This awesome quilt has been hanging in the store for a few days now. Come on and and see it and sign up. There is pre-cutting to do for this class so don't wait til the last minute! 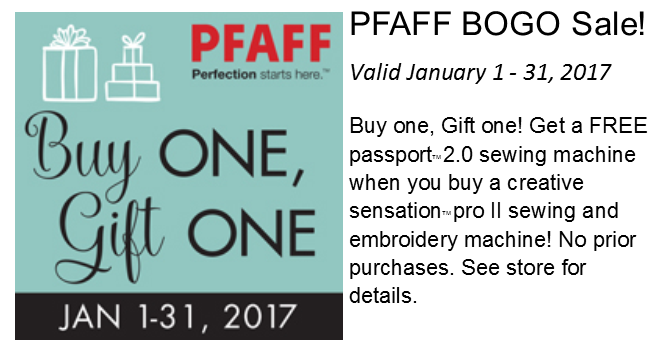 Just a couple more days on the Pfaff specials. See below. LOST AND FOUND: We have a red jacket that was left here a couple months ago. I think it may have been left after a class. If you're missing one, let us know. To enhance our customers' creativity by sharing expert advice and knowledge; providing tools, services, inspiration, education and by making this store a fun place to be. 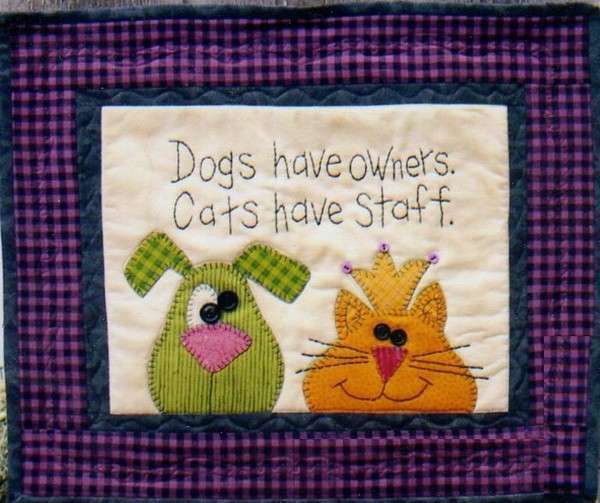 Jean's Quilt Tip of the week! After you finish the front of your quilt, it's time to get a back for it. We have several wide backs to choose from. They are 108" wide. You can piece the back using fabric leftover from the fabrics used on the front. If you are having your quilt quilted on a long arm machine, the back needs to be larger by at least 3" all around. Try to keep the seams toward the center of the backing, avoid putting any seams on the backing that would line up with the edges of the front. That could cause a problem when you go to put on the binding. Horizontal seams are preferred on the long arm. If you are doing the shop Mystery Quilt, this next step involves making the blocks. I suggest you press all the seams open. This will make nice flat seams when you go to join the blocks together. We're inviting you for a sweetheart of an opportunity before February even arrives. For those who have been tempted to buy Premier+ embroidery software, it's time you treat yourself! From now until Feb. 10, sign up for a personalized demonstration of Premier+ and True 3 embroidery software with me, Thursday through Saturday. Premier+ (for PC) and True 3 (for Mac) is embroidery software that expands your ability to personalize your designs and supports many file formats. By scheduling your personal demo, you'll see all the possibilities at your fingertips and figure out what product is right for you. 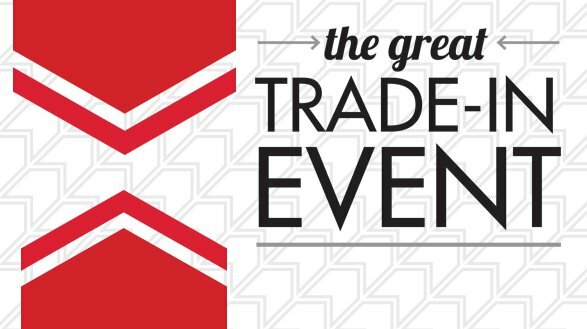 Sign up and take advantage of a special event discount of 20% (that's up to $460 in savings! ), as well as a one-on-one training session and FREE ongoing Beyond the Basics classes. Already have Premier+ or True 3 software? 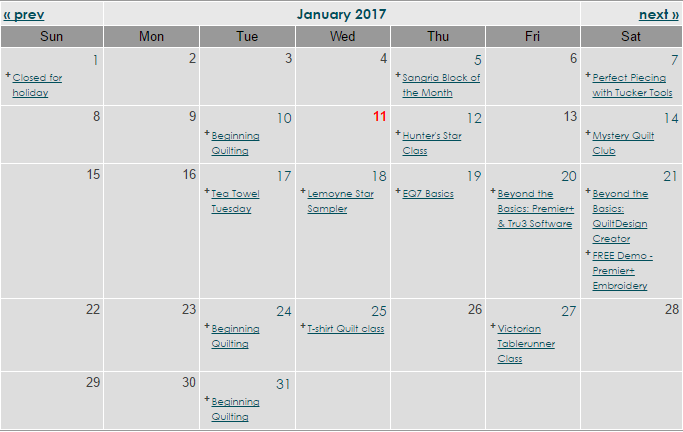 Then here's your friendly reminder that each month, we have a monthly software club called Beyond the Basics! We learn how to use different wizards and new techniques, and the handouts are perfect as personal reference tools. Bring your laptop to experiment during class or watch on the big screen, whichever works for you. 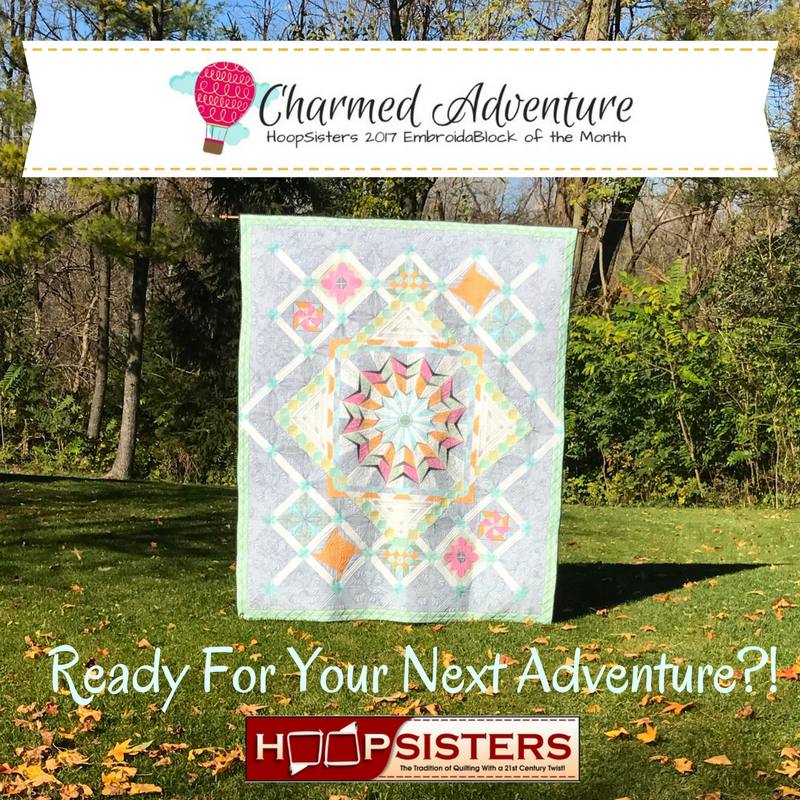 A BIG Hit at Quilters Headquarters! The Qnique 15 inch mid-arm has been a real hit in the store. 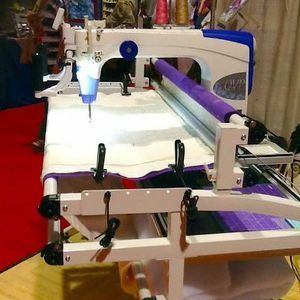 If you thought you would never be able to afford a longarm or just don't have the space for one, this machine might be a perfect solution for you. It is a lower price and has an optional 8 foot set-up, but you're still longarming! A perfect compromise to the traditional larger machines. You will be very surprised at how comfortable this chair is. In many colors to match your decor. The cushion lifts up to store your M&M's! By hand or software driven the Juki TL-2200QVP is a pleasure to drive for it's smooth and solid stitching over layered fabric and paddings. Price too low to publish. Bob can repair your machine and get you back to enjoying your sewing time. He can have it done in just a couple of days. He will also provide same day service if you call ahead and let him know when you will be here. Bring in your Featherweights if you need new cords or belts. Making and/or applying bias binding, binding on curves or other special applications may cost extra. I'm pretty excited about some upcoming travels that I have on the calendar. Since I've become a certified instructor for Studio 180 Design, I have been asked to do several programs for various guilds and events. So far, I'm booked in Nebraska, Colorado, and Minnesota. Pretty cool! Most of them are out long enough for me to make some more quilts to show which is half the fun! JUKI just sent us a fabulous February promotion. 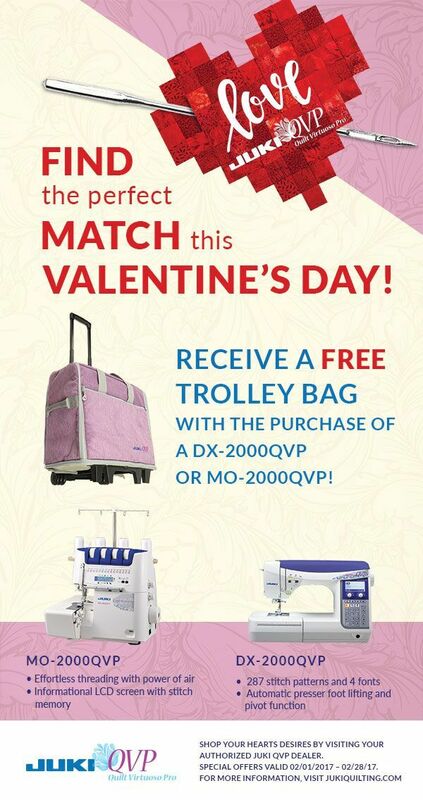 Get the DX-2000 QVP or the MO-2000QVP serger and receive the luggage for free! What a cool deal. I'm letting you in on this a few days early so let me know and I'll get a bunch ordered in! As many of you know, I sew on the DX-2000 at home and absolutely love it! 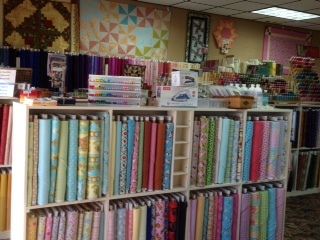 And Quilters Headquarters is one of the select few QVP dealers chosen by JUKI to carry the QVP products. 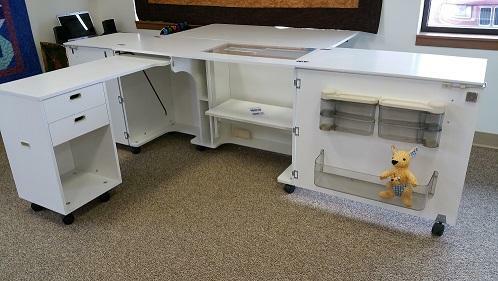 Kangaroo cabinets has made some changes to the Aussie sewing cabinet so we are letting our floor model go cheap so we can bring in the new one. With assembly, the cabinet new would be $1375. We are going to let it go for $999.00 - you come get it! Also don't forget about our Anniversary Sale that we have going on now too! Bob has sweetened the deal that Pfaff is offering. 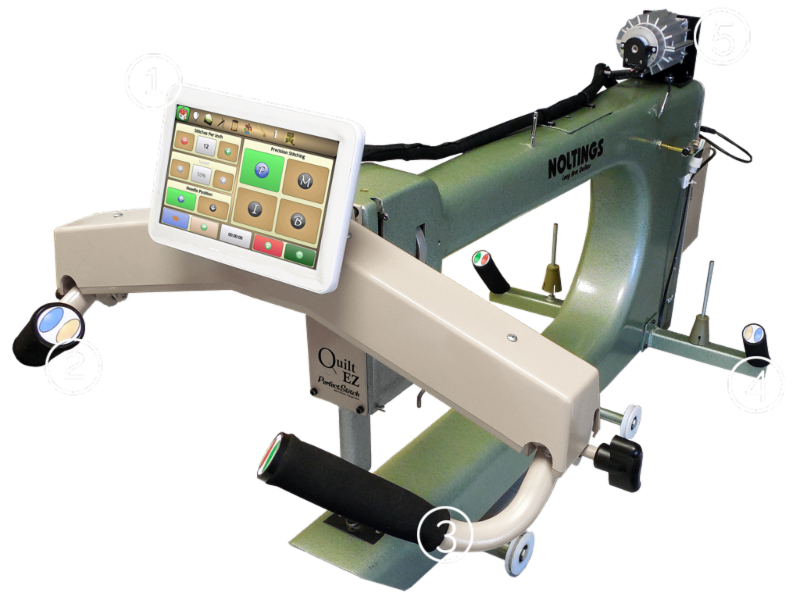 In addition to the FREE Passport with the purchase of the Sensation Pro II, our top-of-the-line embroidery machine, Bob is giving you a $2,699 discount AND One WHOLE YEAR of OESD Spree Club. Spree Club is an OESD club that includes 5 Embroidery collections (approximately 10 designs) each month already loaded on a USB stick for your machine. This is a value of $999! You are getting a $12,697 value for only $8,300! 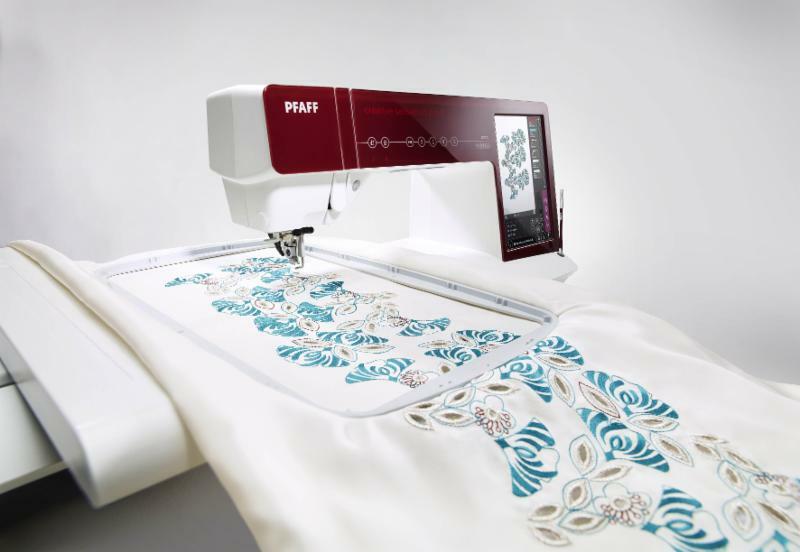 Our most popular Pfaff embroidery machine is the Creative 4.5. Bob has discounted that an extra $599 AND One WHOLE YEAR of OESD Spree Club! A value of $8,297 for only $6,099! This offer is good until the end of this month only. With these prices, you don't have to wait for an Embroidery Event special. You can have it now! And with 0% financing to boot! 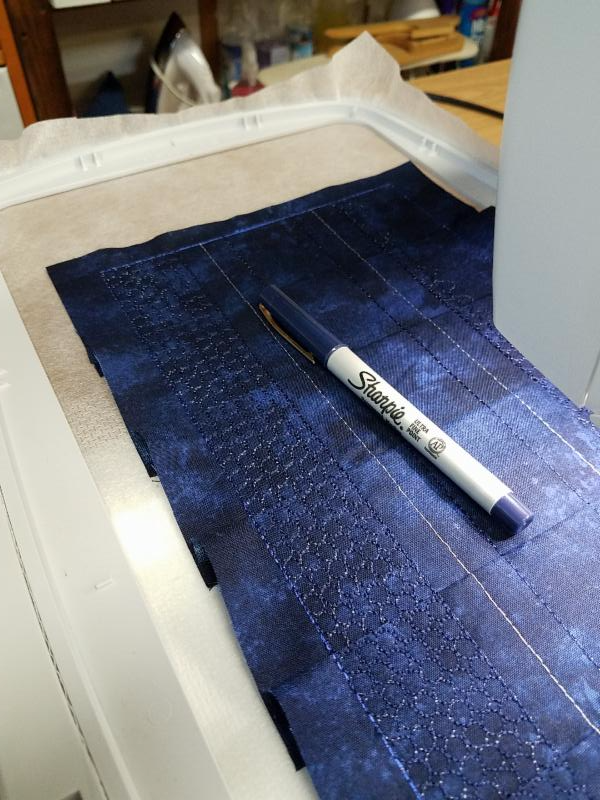 With Darcy on board as our Embroidery Educator, you can be sure you will learn and enjoy your new machine through many clubs and on-going classes! But wait, that's not all. 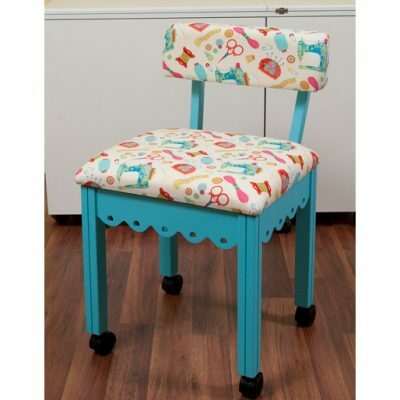 Many of you have admired our new Arrow sewing cabinets and the cute chairs. We are offering the Olivia cabinet and matching chair, a value of $934 for only $825. This will include free assembly and delivery within 50 miles! I am excited for Lori to teach us all about EQ7. Can't wait to see what's new. I've had EQ5 for a few years and have found it easy and fun to make up my own quilt patterns. It's fun to play with the different blocks and fabric. Another way to design quilts and blocks would be to use things you have around the house such as plates, cups and saucers. Also cookie cutters. For applique ideas, check out coloring books for very small children, they have large designs in them and maybe they would work in your project. If you know of anyone that has been wanting to learn how to make a tshirt quilt, I am teaching a class next Wednesday the 25th. 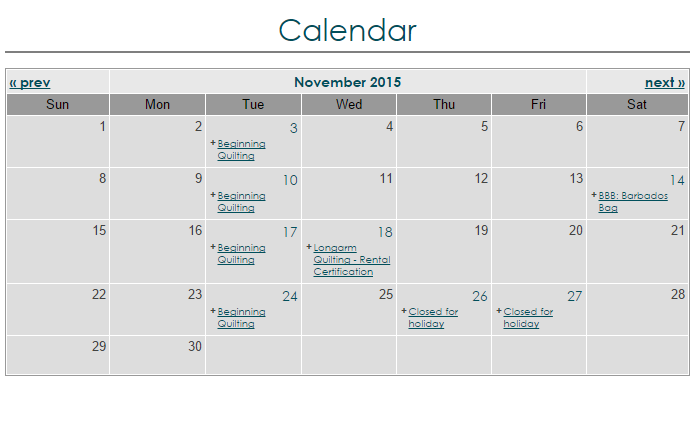 Give us a call to get signed up or go to our website calendar for more information. You can also sign up online. Did you know that one cause of birdnesting can happen because of a bobbin wound too tightly? It's especially a problem when it comes to embroidery - birdnesting can throw off the entire alignment for the remainder of your project. Ask me how I learned that. While there's more than one way to get rid of these pesky birds, when all else fails - a visit to the machine doctor (Bob) doesn't hurt. 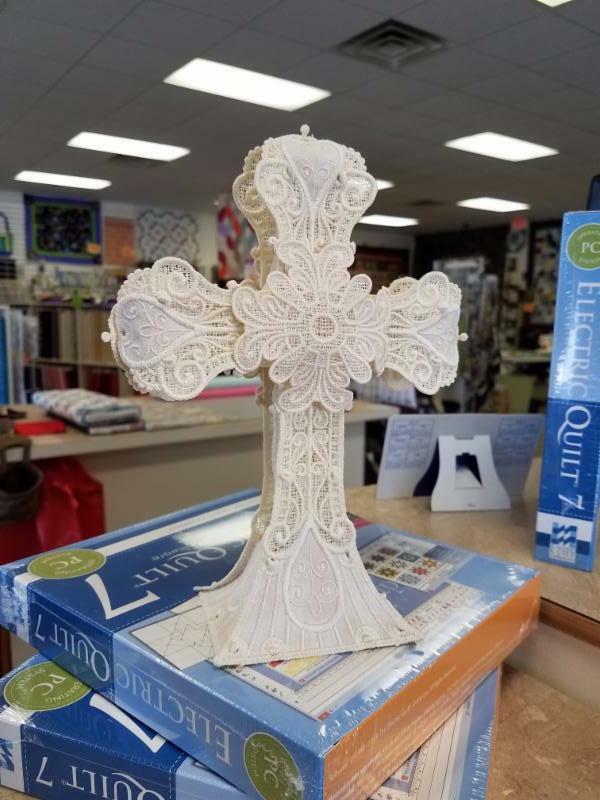 Before you even think it - YES, you are able to make a cross as detailed as this!! And the best way to learn how is to join us for the first Embroidery 101 class, February 25 at 10 am. It's easier than it looks, and you'll feel more confident with ANY freestanding projects! 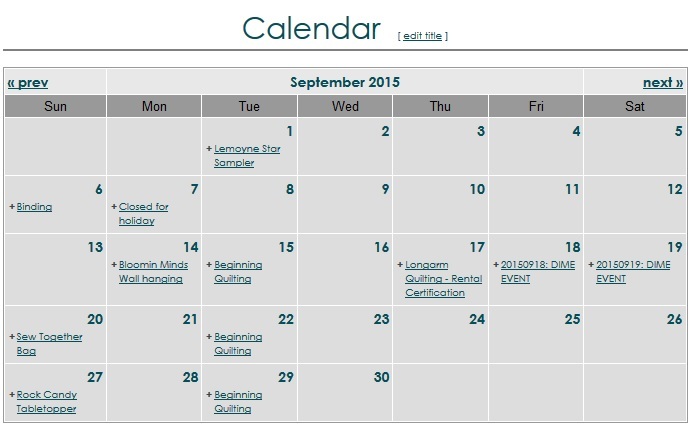 More info can be found in the calendar of classes. Can you believe that we have been in our new location a whole year already? Bob says its time to celebrate! He is sweetening the pot that Pfaff is offering. 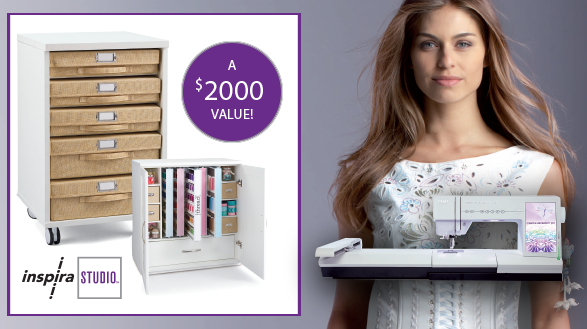 In addition to the FREE Passport with the purchase of the Sensation ProII, our top-of-the-line embroidery machine, Bob is giving you a $2,699 discount AND One WHOLE YEAR of OESD Spree Club. Spree Club is an OESD club that includes 5 Embroidery collections (approximately 10 designs each) each month already loaded on a USB stick for your machine. This is a value of $999! You are getting a $12,697 value for only $8,300! This offer is good until the end of this month only. With these prices, you don't have to wait for an Embroidery Event special. You can have it now! And with 0% financing to boot! 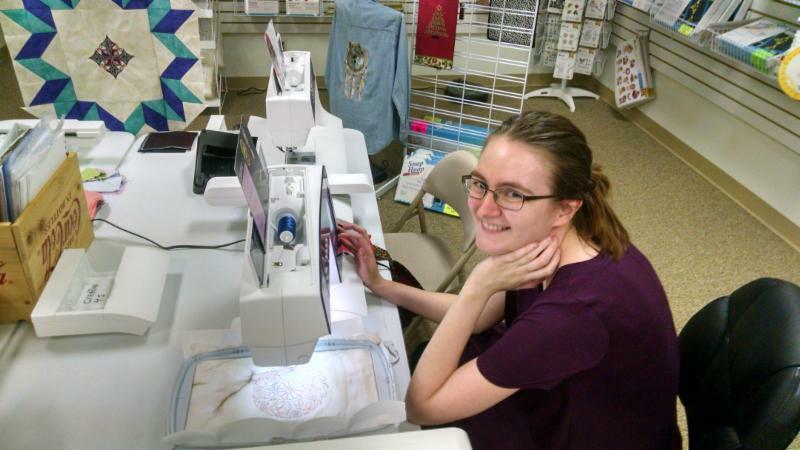 And with Darcy on board as our Embroidery Educator, you can be sure you will learn and enjoy your new machine through many clubs and on-going classes! 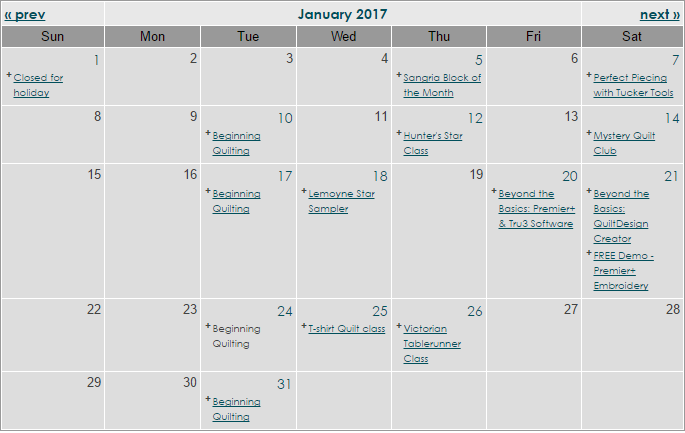 We have a full line-up of classes on our calendar for January. For those of you anxiously awaiting the EQ7 class, I do have it scheduled. 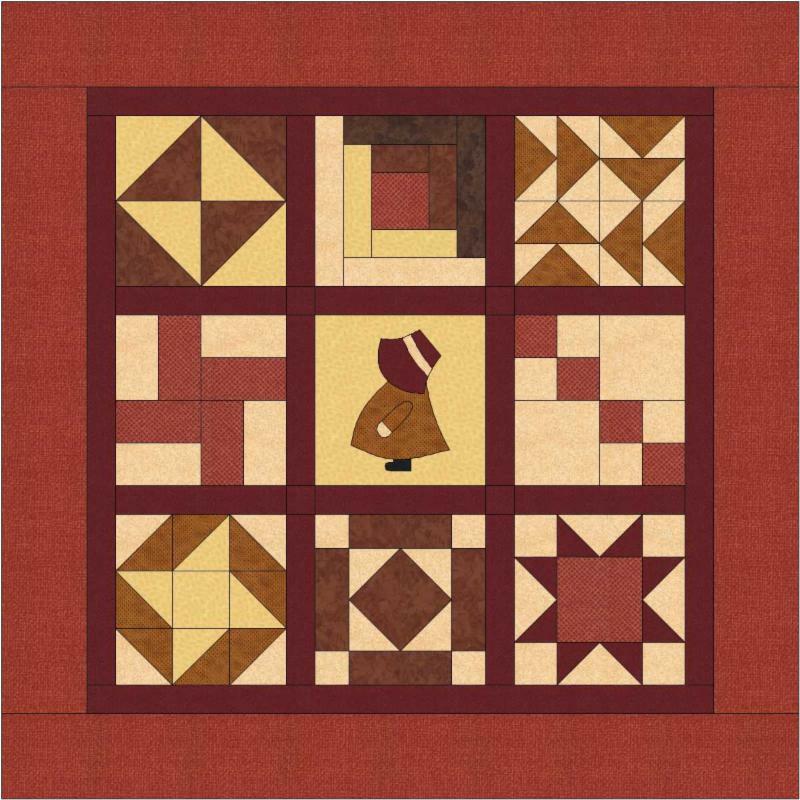 The January class will cover the basics of the application and we'll do a simple quilt design. 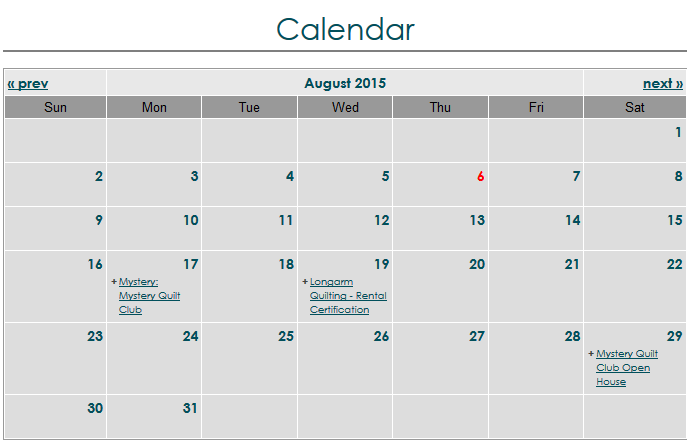 The first EQ7 Basics class is free for those who purchase the software from QHQ. If you don't own EQ7 yet, feel free to come to this class to observe. Bring your laptop and we can load a classroom version for this one class only, but you must come in a few days ahead of class to get it loaded. Please call ahead to set up a time for this. I have taken a photo of every quilt and almost every project I have ever made. Some are in a photo album and the rest are on my computer, waiting to be printed off and entered into a three ring binder or photo album. When you take pictures of quilts outdoors, try to lay them flat so it's not waving in the wind. You could lay them down on a tarp or a drop cloth of some kind. I have even gotten a ladder out to get above it. If you are having trouble with the tension on your sewing machine, another thing you could check is your bobbin. If it isn't wound correctly, it could cause problems. Make sure when you wind it, that it goes through the tension device properly. I don't know about you, but I've bored MYSELF with all this talk about upcoming classes these last few weeks! I've been holding onto a wonderful tip for a while that I've been waiting so long to share with you. Then I promptly changed my bobbin to black. I make the mistakes so you don't, right? 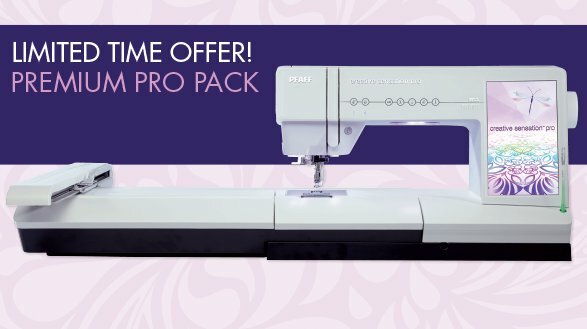 As always, check our Facebook for what we've been up to - we have an incredible deal on our best embroidery machines, new kits, upcoming classes, and so much more! I just finished a new quilt by Wing and a Prayer designs that is really pretty. Jean quilted and bound it for me and we have kits ready to go. 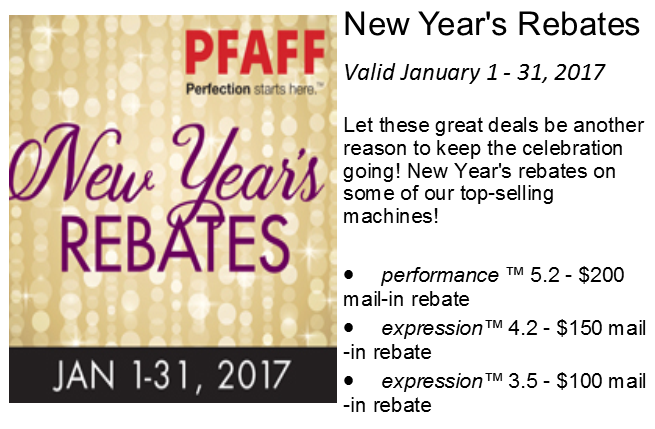 Pfaff has a bunch of new promotions for the month of January. See below. If you are using water soluble markers, use plain water to rinse it out and do so as soon as possible. Ironing and some soaps can set the color in. When you are piecing your blocks be careful with the pressing, especially on the bias, don't use steam until you are all done with the block. Press the seams by picking up the iron putting down without sliding so avoid stretching. When you are done with the block use steam with caution. Where did 2016 go, I'm not ready for all this 2017 stuff! But that's no excuse - I've got classes to schedule and samples to make. The first installment of Embroidery 101 is scheduled for Saturday, Feb. 25, at 10 am. For those who want to learn your embroidery machine, what stabilizers to use for which project, and mastering techniques, this is the class for you - and you don't have to be a beginner. The first class is covering freestanding lace, but has applique elements as well. If you come into the store, you'll see me working on a sample that uses both and is going to be SPECTACULAR! In addition, Tea Towel Tuesday is back! Not only will we embroider the designs, but I'll show you how you can make your own designs from home. Finally, the biggest project on my plate...stay tuned for dates. We it looks like today might be a good day to mention our inclement weather policy again. The best bet is to call first. (605-334-1611) I'm a firm believer of not being out on the roads in bad weather. I don't want to do it and I don't expect my employees to either. That said, I have a few employees that don't stress over it or live close enough that they would be here. Bob and I live out of town so we likely won't venture out if the roads are bad. So call first before venturing out. Tis the season for sales and shopping. 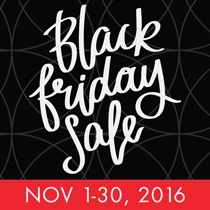 If you've been following our emails and Pfaff emails, you know that Pfaff is offering 25% off machines and Premier+ embroidery software until the end of November. 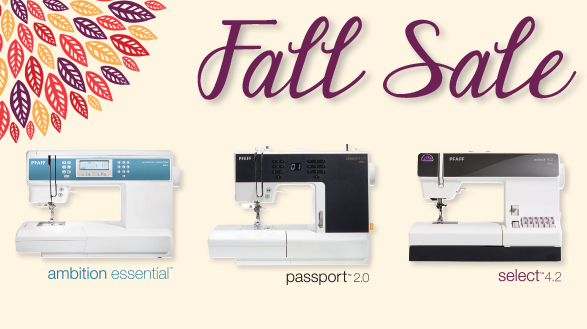 So don't wait, hurry on in to Quilters Headquarters and get one of the best sewing machines on the market at a great price! I think this is the biggest discount I've ever seen Pfaff offer. Along with that is 0% financing on purchases over $3,000. We've already had a few husbands and children come in and do their shopping. If you have something specific on your wish list, be sure to let us know! We can keep your wish list in our notebook and know just what to suggest! Check out our Black Friday sale below - sewing machines, longarms, embroidery designs and 0% finance options too! 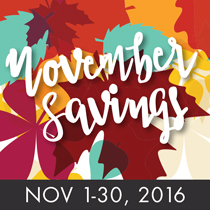 In addition, Quilters Headquarters is able to offer 60 months free financing for anything in the store. But don't hesitate. This offer ends November 19. 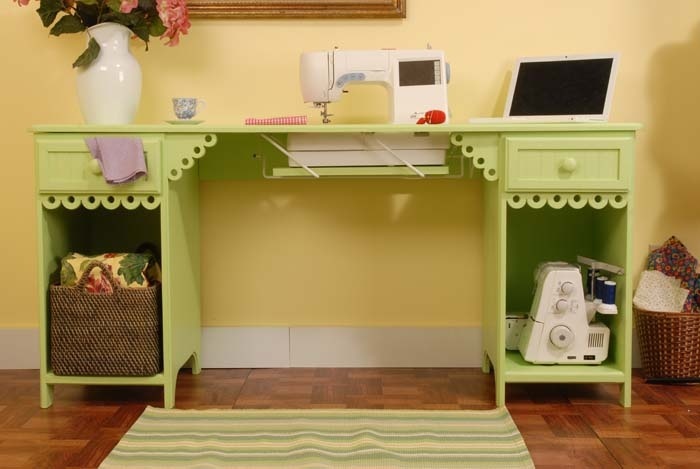 And don't forget, at Quilters Headquarters, you get free lifetime training on your machine! I know many of you are busy making Christmas projects and presents. Darcy has embroidered some really cute gift card holders. 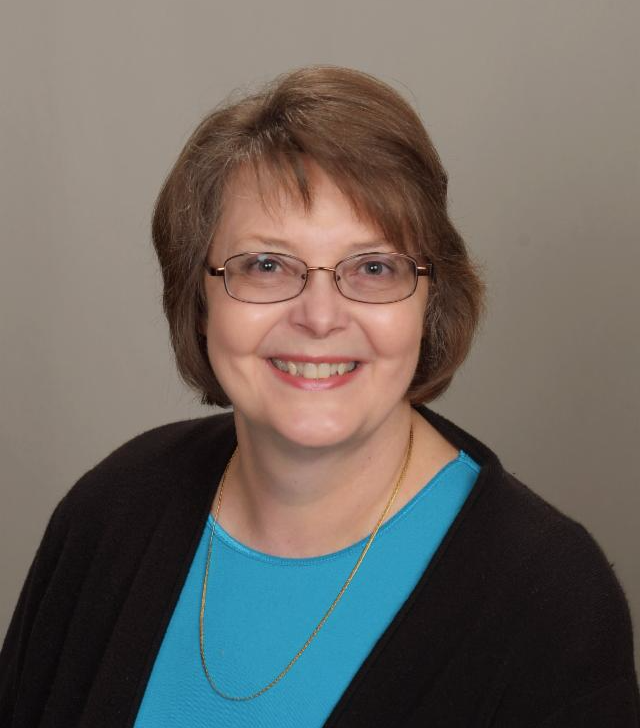 Be sure to read Jean and Darcy's columns below. 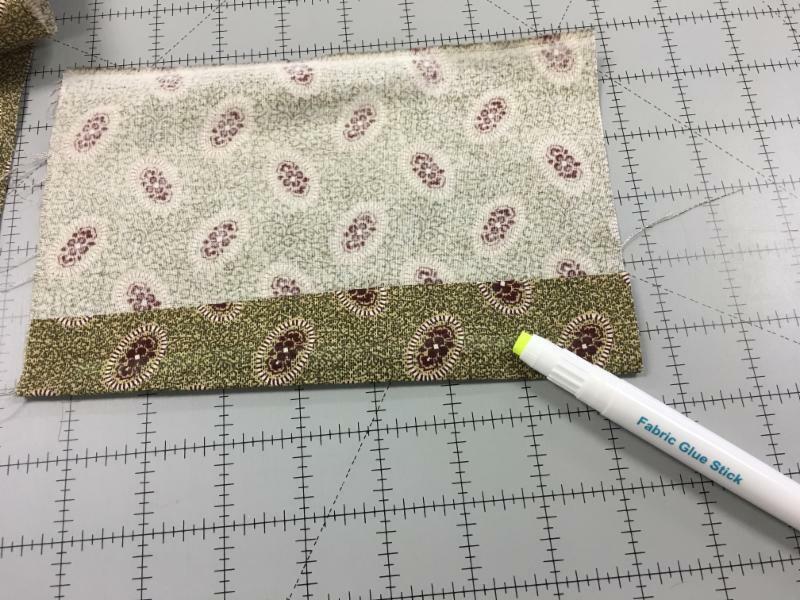 Jean has tips on cutting and matching fabrics and Darcy has set up her software classes that you don't want to miss! The holidays are upon us. Don't forget we have FREE Open Sewing every Monday now. Get away from the laundry and interuptions and come sew with friends! Get those Christmas gifts done! How to cut a 8" strip with a 6" ruler. Use two rulers, put the first on on the edge with the 2" you need and put the 6" ruler right up against it. Line the 6" ruler on the fold and cut. This works for any size strip you want, you just need to do the math adding the rulers together where needed to get the size you want. 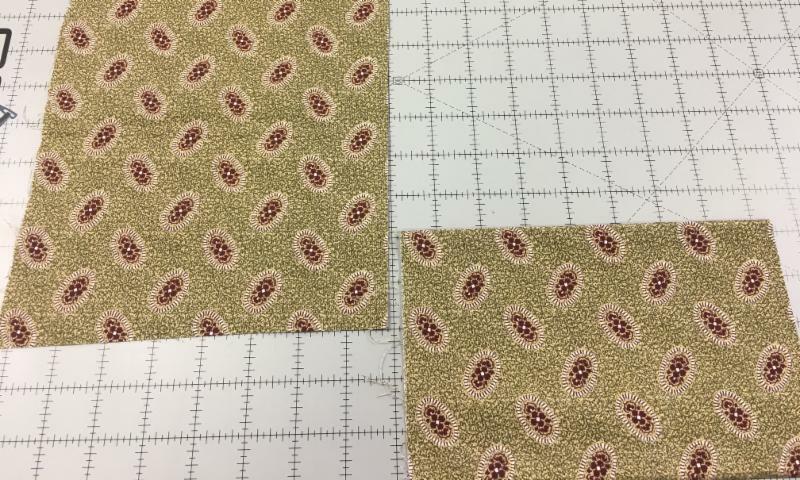 How to match two fabric pieces, when there is a definite design and you need a larger size such as for a backing. Fold the piece you want to add at a place that will line up with the piece you are connecting it to. The holidays are around the corner, which means 1) Happy Birthday Mom and Dad! and 2) we have good news to share! Starting December, I am teaching software classes! Dec. 2nd & 16th is Beyond the Basics with Premier+ (Windows) and Tru3 (Mac) embroidery software. Each month you'll learn new techniques, and we have two sessions scheduled so you can choose between a morning or afternoon class. 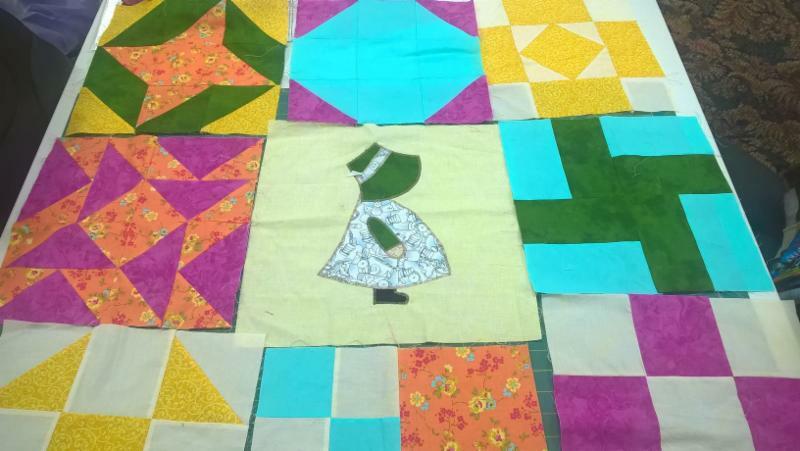 We also have a class for QuiltDesign Creator, which will be on the 3rd Saturday of the month. Each class is only $10, but if you sign up with us for a full year, it's only $80 (that's 4 months free!). 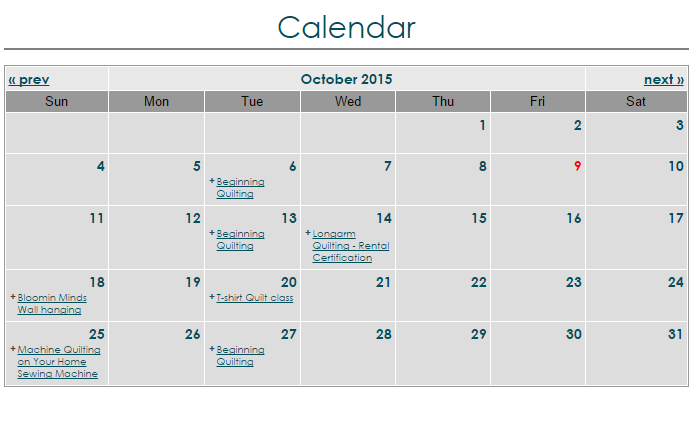 We have even more incentives included, so make sure to check out the full class descriptions in the calendar below. Also: Need a project to keep yourself warm? We now have in stock some popular OESD embroidery designs, so come in and check them out! We're back from Quilt Market! We had a lot of fun and got a lot of new ideas for projects. I am working on a new Block of the Month quilt that will be sure to be popular. And Jean doesn't know it yet, but she'll be getting a new mystery quilt ready soon too. I also am bringing in a new laser cutter so I'll let you know when it gets here. And lots of new patterns that we are going to try out. We spent a lot of time in classes but its always good to be home. We drove through blizzards in Wyoming and in Yellowstone Park. That was fun too! Jean will be demonstrating mitered borders at 2:00PM this Saturday for our free demo. Come in and see how to make a perfect miter. We've scheduled an Open Sew day this Saturday, May 28, 9:30 - 4:00. Its Memorial weekend and I know a lot of people are out of the area, but for those of you who are planning on staying home and sewing, please come in and sew with us! We would love to have you! We will be closed Sunday and Monday, May 29 & 30 for the Memorial holiday. I'm starting a new Beginner Quilt class on June 14. It will run for 5 weeks on Tuesday nights. 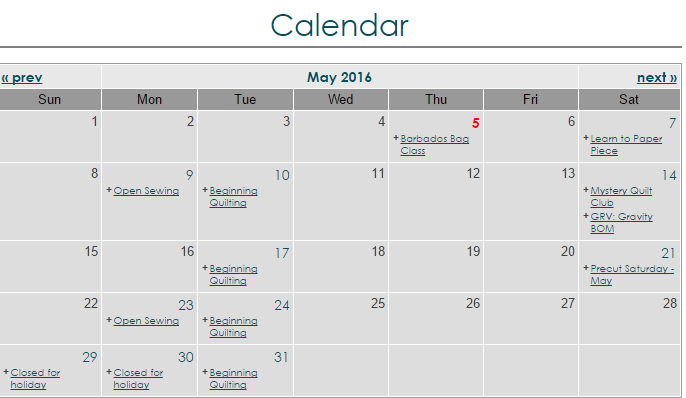 Check it out on our on-line calendar for details. Row by Row is ready to go for the summer shop hop. This year's theme is "Home Sweet Home". We are working on making kits. The shop hop begins June 21. Our license plates are in. Also we have the Row By Row fabric. We have been carrying the Happy Multi needle embroidery machines for not quite a year now and Bob and I decided to discontinue them. They are beautiful, wonderful machines but it seems there isn't a lot of demand among our home embroiders so we are letting them go almost at cost. We have two left, a 7 needle and a 12 needle. Neither one has been used at all. So if you are interested, come on in and discuss with us. May specials are out for Pfaff. See below. First I want to thank you for all the wonderful comments on my binding video. All the responses have been overwhelming. We might have to make another one sometime. My tip this week is to use your camera for another eye on your finished quilt top. Most of us have phones with a camera on them. When you look at the picture of your top on the phone or camera, it looks just enough different that you can see if you like the layout or if a piece is out of place. 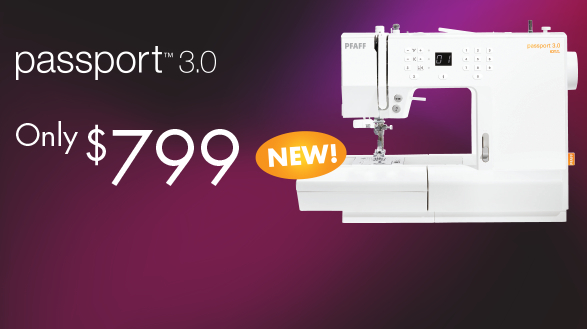 The creative sensation™ pro II sewing and embroidery machine is the latest evolution of PFAFF®'s advanced technology. From May 1 until May 22, take advantage of our 48 month 0% financing on this extraordinary machine. Are you tired of changing threads on your embroidery machine? You truly can load your design and threads and walk away. Would you like to be able to embroider on jeans without cutting open a seam? Embroider on caps, golf bags, luggage, lawn chairs, jackets, shoes, boots and more. 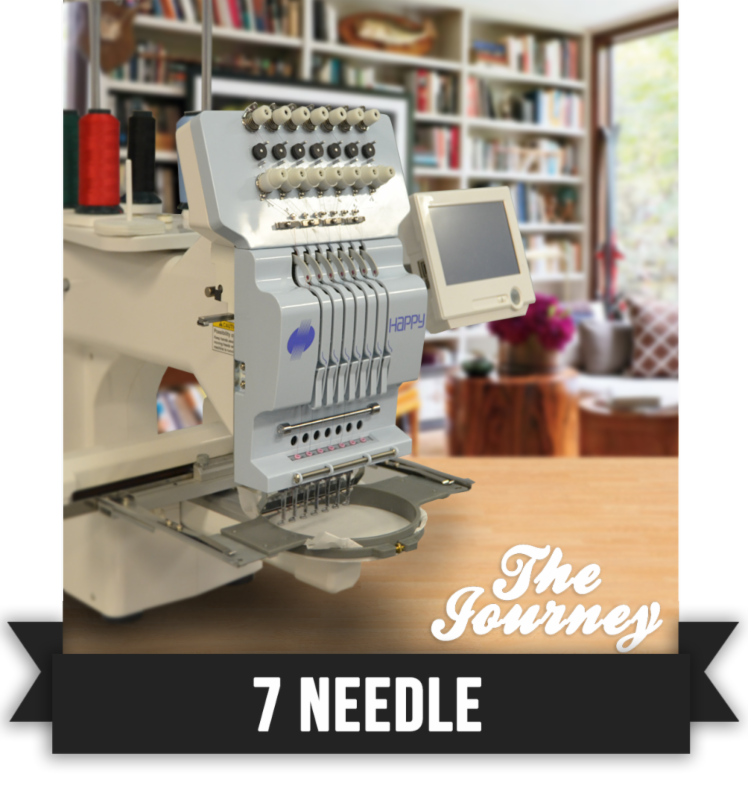 You can do all of these things on our new machine for the same price as a single needle embroidery machine. Our introductory offer includes shipping, set up and training. Stop in and see this awesome machine. By hand or software driven the Juki TL-2200QVP is a pleasure to drive for it's smooth and solid stitching over layered fabric and paddings. Price to low to publish. 7" Color Touch Screen Display - Enjoy an easy-to-use, high-resolution touch display. Four Programmable Handle Bar Buttons - Perfect Stitch is the first machine that gave you programmable handle bar buttons. 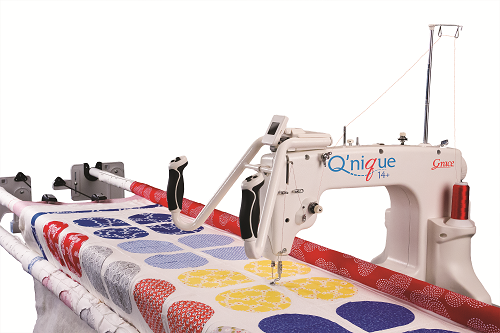 Adjustable, Ergonomic, Comfort Grip Handles - A day of quilting just got more comfortable. Rear Handle Bars - Outfitted with the same programmable buttons as the front handle bars. If you don't already have rear handle bars, we'll add them for you. New DC Brushless Motor - Our computer-controlled motor will adjust to you, ensuring that you never outrun your stitch regulator. Stop in for our special pricing thru the rest of May. Ask about the new modern designs. Jean is turning out quilts every day. She will also do modified custom quilting for you. For .03/square inch she will do your borders separate with a pretty border pattern and edge to edge on the body of the quilt. Only 14 more days til Christmas! 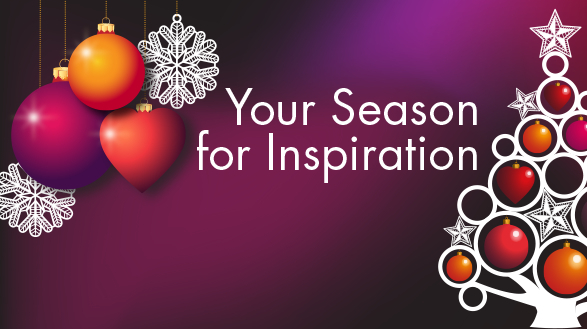 Remember your quilting friends this year with gift cards from Quilters Headquarters. Our gift cards have no expiration date. You can apply them to anything in the store so make sure your loved ones know that a gift card from QHQ is on your wish list too! We also have a lot of new books and precuts just in for your secret pal! 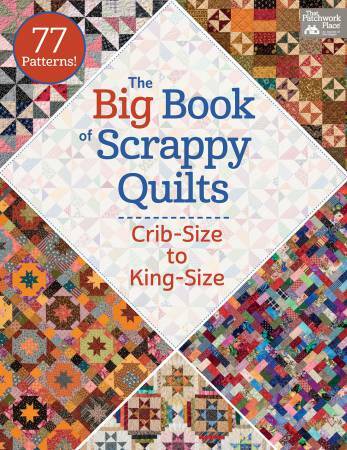 One of Jean's and my favorite books is the new "Big Book of Scrappy Quilts". You'll be seeing me make a few quilts from this book. What a great gift this would be! We will gift wrap for you too! I still can't spill the beans on our new location yet but I did go pick out carpet yesterday! You can peek ahead at the classes I have on our calendar for next year. I don't have all of them on-line yet but I'm getting there! We are planning our gorgeous Gravity BOM, Pre-cut Saturdays, Open Sewing days, Software classes, and Jean has the next mystery quilt ready to go! Also, our next DIME event is scheduled for April. Whew! I can't wait til we move! We are considering being open on Sundays from noon to 4:00 in our new location. I would love it if you would shoot me an email and let me know if you would like Sunday hours. I know that our Sunday classes have been received very positively so far so please let me know what you think. I appreciate your feedback. Always take care when using your rotary cutter. The blades are razor sharp. Get into the habit of locking the blade after each cut. Especially if you have children in the house that might pick it up. Before cutting your strips, you'll need to make sure the fabric is folded straight. When I bring my fabric home, a lot of times I will press it by opening it and refolding it in half selvage to selvage. When you are ready to cut it, place the ruler along the right side of the fabric with a horizontal line marked on the ruler along the fold. Hold the ruler firmly with your left hand. Keeping the blade against the edge of the ruler, push the cutter away from your body, never cut towards you. It is a good idea to check that you are still cutting at a right angle after every four or five cuts. If you start cutting away from the right angle you will find a V-shape in your strip when you open it up. Support your local quilt shop. Before you order on line, check with us. If we don't have it, we can probably get it for you within a week and you won't have to pay shipping. Finally I have all my blocks done. After some deliberation I, with the help of Mom and Bob, arranged the blocks so that the sashing can be the next step. I am very happy to see all my hard work put together, into one piece. I think it will turn out great, maybe not a perfect square, but hey its only my first quilt right? This is an awesome quilt, 96" x 97". We have it hanging in the shop for you to see in person. We will run this BOM for 11 months starting in January. The kit itself is $215 but we are going to break it up for you into $20/month for 11 months. In the first month, you will also need the Super Sidekick ruler from Jaybird quilts and the second month you will need the Hex n More ruler. If you purchase the first ruler from us and sign up for the BOM, we will give you the Hex n More ruler for free. I would rate this quilt as intermediate as it does have some challenges. We will have this as a classroom setting so you can come in and sew each month with Lori as the instructor. January will be in the Mac Pros classrom (but tentatively scheduled for the 3rd Saturday) and after that we should be in our new location on the second Saturdays of every month. Jean is turning out quilts every day. She will also do modified custom quilting for you. For .03/square inch she will do your borders separate with a pretty border pattern and edge to edge on the body of the quilt. Our turn-around time is approximately four weeks right now. At Quilters Headquarters, we want to make your love of quilting not only fun but affordable. Our fabric is and always will be premium first quality 100% cotton fabric. We offer mostly blenders. Blenders are fabrics that are shades of one or two colors and "blend" well with other lines of fabrics. 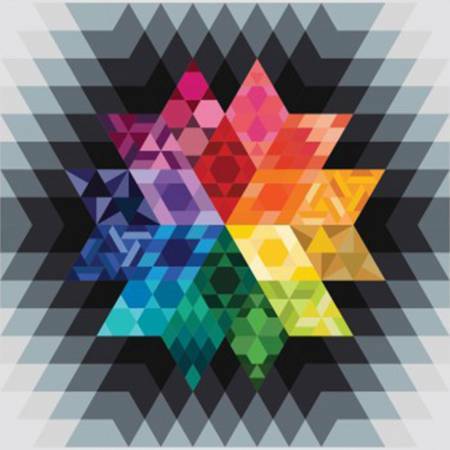 We carry an infinite rainbow of colors that will blend with any project you are working on. Unlike specific lines of fabric that are only printed once, blenders are often re-orderable. 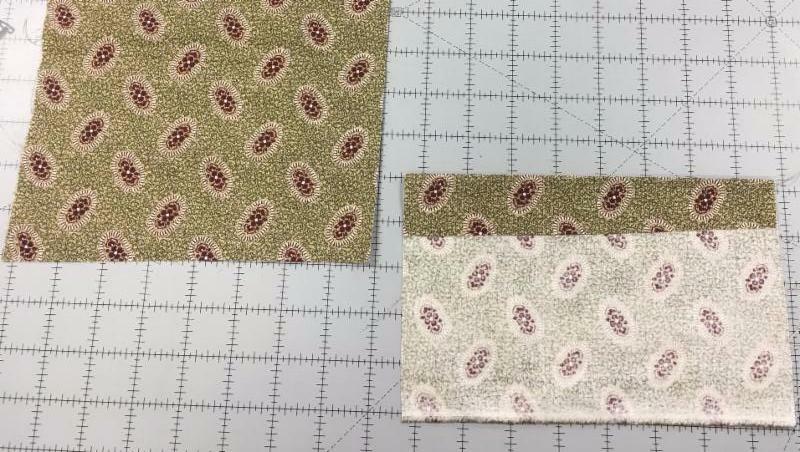 All of our premium cotton quilting fabrics will be $8/yard with a minimum one yard cut. This includes flannels. We will maintain this price as long as the price of cotton doesn't jump again! We also offer a discount on batik fabrics when you get a one yard minimum. For and cut of a yard or more, you pay only $11.50 per yard. This is such a busy season and I hope all of you are enjoying the season and not stressing out! Remember its time for family and fun, not stress! I want to let you all know that we are letting Bob get back to retirement part-time. Our original goal was that he would help me start this business and then step back into retirement. Well its been five years now and we still need him part time to fix machines. He will be here on Tuesdays, Wednesdays, and Saturdays to repair machines. So those will be the only days available for same day service. You can still drop off and pick up during any store hours. We are working on our 2016 schedule and I think you are all going to love our new large classroom in our new large space. We are much closer to closing the deal but I still can't say where til all the papers are signed, but I'm feeling pretty confident at this point that we will start moving in February. I am so looking forward to a bigger space! Jean is all ready for our next mystery quilt. We will start in January. Our Gravity Block of the Month has a huge following and is going to be a lot of fun. I will be making another Gravity quilt myself along with the group. I believe I have kits for about 5 or so more people. Feel free to stop in and see the quilt hanging in the store. Some people are going to put borders on it to make it a little bigger. We are having a lot of fun with our Happy 7-needle embroidery machine. Check out the details below. If you love to embroider this is an awesome machine at about half the price of a single needle sewing/embroidery machine and twice the speed. 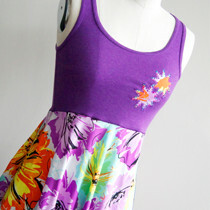 You can be sewing and embroidering at the same time and not jumping up all the time to change thread colors. Whenever possible purchase enough fabric to cut borders on the lengthwise grain (parallel to the selvage edge). It is the strongest grain and will help to prevent stretching and fullness along the outer edges of the quilt. If you have to piece your borders there is a couple of ways to do that. sew your strips together with a 45 degree angled seam or a straight seam. Some say the diagonal seam will be less noticeable than a straight seam. Others say the diagonal stands out and is more noticeable. I think it depends on the fabric. The diagonal seam will use more fabric. Sometimes you want to match the fabric pattern. It's fun to find a border print and miter the corner on the border. My border seams are all pressed open to avoid thickness. I hope everyone had a great & relaxing Thanksgiving. Can you believe the year is almost over? My quilt is not quite done. I have begun to sew the sashing to the blocks. My Mom was very adamant about me finishing my Sunbonnet Sue. Surprisingly, it turned out great!! She will be the main square in my quilt. I really wanted to personalize my quilt to fit me to a T. So I gave Sunbonnet Sue a unique look...Meet Nurse Sunbonnet Sue!! 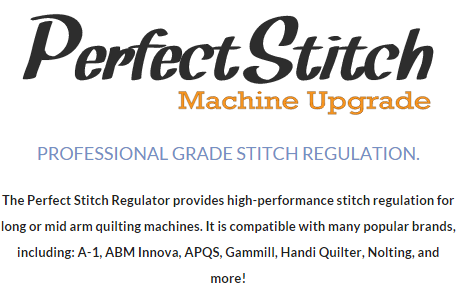 It has been suggested from many people that I should mention in my newsletter why I am so adamant that Pffaf is the best machine on the market. So here's why I get so excited about Pfaff. Ever since I started sewing on a Pfaff, my sewing is practically perfect. Everyone thinks I'm a great seamstress but really its because I have a great machine. Pfaff invented the original "integrated dual feed" system over 70 years ago. I never have to worry about the top layer being pushed ahead of the bottom layer. The seam always lays flat and perfect. I NEVER have to pin! So people think I'm very speedy when I make a quilt. Imagine how much time you save if you don't have to pin any seams! Yes, there are other machines out there that have tried to copy the dual feed or tell you that it is the same as a walking foot. I promise that it is not like a great big ole' walking foot that you can't see around. And besides all that, Pfaff gives you more bang for your buck. They are reasonably priced compared to other brands. So there's my soap box on the greatest machine ever. I hope when you are shopping machines that you will come on in and try out a Pfaff! Pfaff makes sewing fun! It seems winter is fast approaching so its a good time to mentions our inclement weather policy. And basically, if we can get to the store safely, we will be open. So call ahead. If we have a class scheduled and we cancel, we will call you so make sure when you sign up for classes that you give us your phone number. I will also post on Facebook but I know that not everyone uses that. Also, I'll mention our holiday hours. It has been my past experience that Black Friday is very slow for us so we have decided to give ourselves and our employees some holiday time off. We will be closed Thursday and Friday and open on Saturday. If you have been looking at our Studio furniture, I am very sorry to say that it has been discontinued. I don't know why because the furniture is awesome and it sold very well. We still have two of the thread cabinets in stock, still in the crated box. While supplies last, you can get one FREE with the purchase of a Creative Sensation Pro OR we will let them go for $1000 - you come get them. You're saving $500. I got tickled when I read Leah's article this week. Like many beginners, she would like to do everything perfectly and if its not perfect, don't do it at all. I'm going to convince her to do it anyway. She has been holding off on embroidering Sunbonnet Sue because her practice piece isn't perfect. Help me encourage her that its gonna get better the more she does. I'll bet when she posts her Sunbonnet Sue, it will look great! 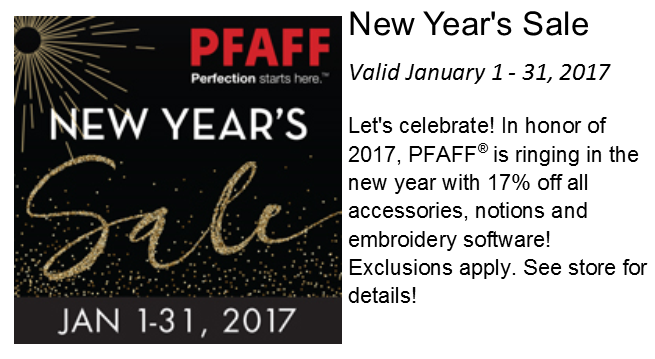 Pfaff is having a great sale this weekend - 2 days only -- 25% off AND 60 months free financing on select machines. I have the details posted below. I have never seen them offer these prices before so if you've been considering a new machine, this is the best deal we have ever seen. The timeframe is limited so don't wait! See below for info on our new BOM that starts in January, and our sale on cabinets and sewing machines! People often ask "How much does it cost to quilt a queen size quilt?" Well it depends on the size of your queen size quilt. The size varies with how much you want to hang over your mattress. Below is a list of mattress sizes. An average queen size quilt is about 84 x 104. We charge .015 per square inch for edge to edge. That size would cost $131.04 plus batting and thread. We sell batting off the roll as well as packaged batting. If you want to piece batting, we have a product called Heat Press. It's a tape. Lay your batting edges together (not overlapping). Press the tape over the two edges. Last week I got to experience SF Quilt Guild. Mom and Bob did a trunk show and they asked if I would help. So of course I did. It was fun and I got to see some quilts that Mom and Bob made. Those two are very talented. 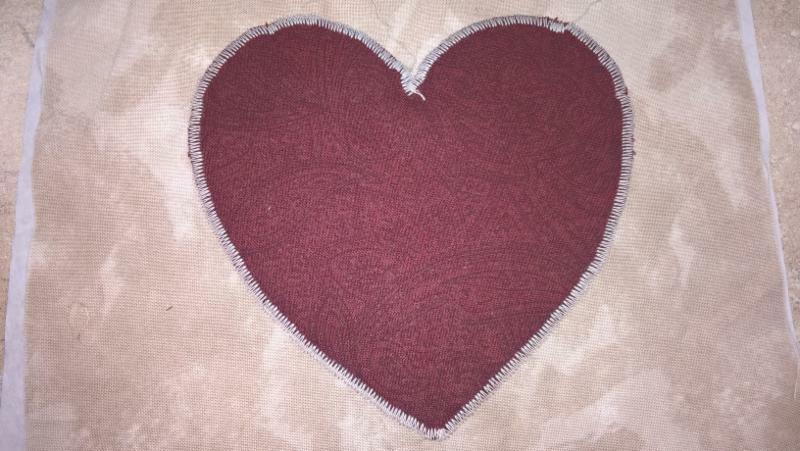 Here is my "practice" satin stitch around my applique heart. As you can see... not very good, and very disturbing to me. However it is MY FIRST try. I am a little nervous to see how I will do when I do the stitch around my "Sun Bonnet Sue". Wish me luck!! 60 months 0% Interest on the purchase of creative sensation™ pro, creative™ 4.5, performance™ 5.0, PREMIER+™ and TruEmbroidery™ 3 elite made with your Sewing and More credit card. See store for details. Bonus designs and stitches - over $400 Value! 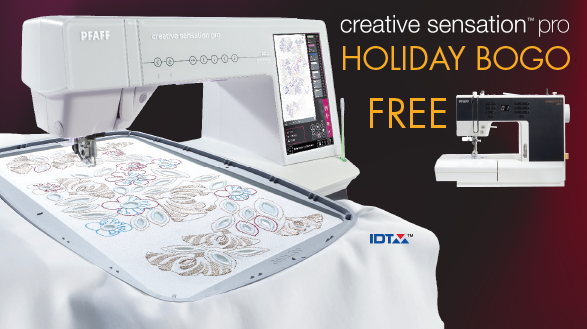 Purchase a creative sensation™ pro and receive 20 bonus stitches and 50 bonus embroidery designs. Over $400 Value. Work on our parking lot will be complete today. Bob and I have been on the road for the last 8 days delivering Gammill and Pfaff longarms. We made it through 5 states. Our first stay was in Verdigre, Nebraska. What a neat little town! We stayed in "the Hotel" there. It was a very old but very cool Hotel and is often used for quilt reteats. I would recommend it highly. Neat town and neat people! Then it was onward and upward through North Dakota for a Gammill delivery, through Montana with a Pfaff delivery and back home again. What a trip! Good to be home but so fun to meet new people. 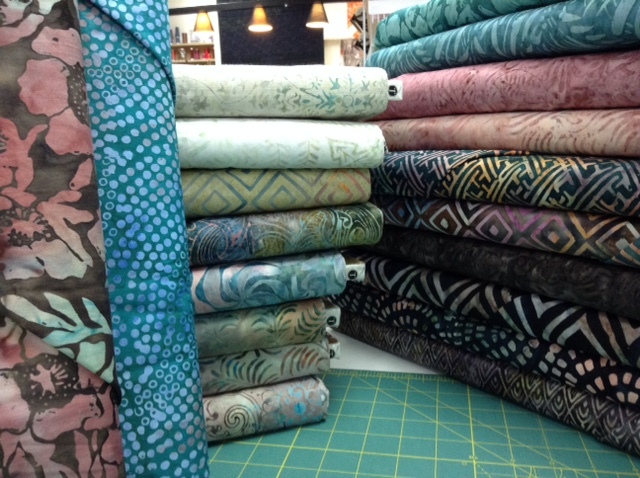 New products -- New batiks from Timeless Treasures and a bunch more precuts from Moda arrived again this week. 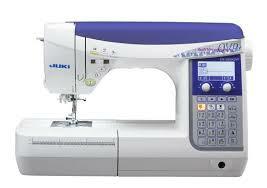 We are very excited that our new Juki longarm is here. It is a beautiful machine and I can't wait to put a quilt on it! I'll be setting up a class on it soon for those of you who have been thinking about purchasing a longarm. 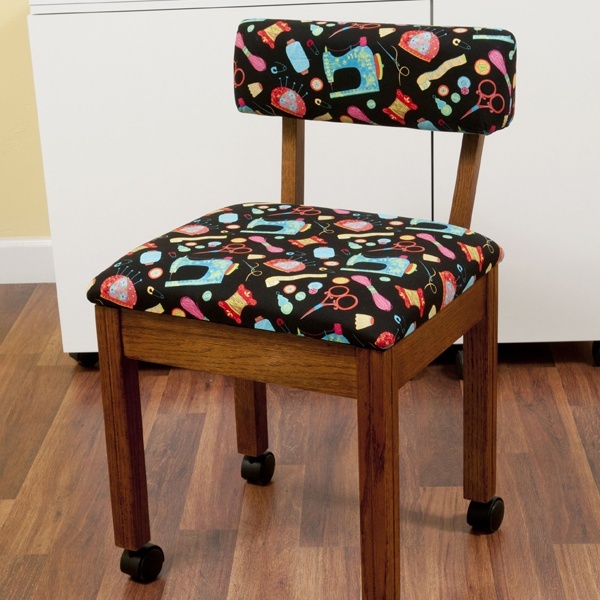 We are already taking signups for Judy Nissen's "Machine Quilt on Your Home Machine" class. This class is scheduled for Sunday October 25. I'm really excited to have Judy doing this class for us. Come on in and see her quilting and get signed up before it fills up. I know I'm going to take her class! She has great quilting ideas and even though I have a longarm, sometimes its just nice to sit down and quilt too. And I know I can also apply her ideas to longarming too. I can't wait! We have also joined the Fabshop on-line shop hop in October. You can find out more about it on our homepage. What to do with all your scraps and stash! We just got a great book in. "The Big Book of Scrappy Quilts" 77 patterns, Crib size to king size. It is also full of tips. I throw all my scraps in one basket, then when time allows I cut them up into 5" squares or different size strips. 1 1/2", 2" or 2 1/2" etc. I keep the different sizes sorted. You could even sort them by color. When I find my next favorite pattern, I will probably sort them again into brights, batiks, floral and so on. One of our customers keeps all her extra binding strips together. That will someday make a nice strip quilt. Also don't be afraid to sew up all the larger scraps to make an interesting back for your scrappy quilt. Choose between our ambition essential™, passport™ 2.0 or select™ 4.2 for only $599. Do you take your machine on the road or to retreats? The Passport 2.0 is a great machine for that. It is lightweight, has the awesome IDT dual feed system. 70 Stitches including, utility stitches, buttonholes, decorative stitches, quilt stitches, needle art stitches, and satin stitches. Stop in and drive this great little machine. Find this button on our website and enter to win one of over $27,000 in prizes during the Quiltmaker's 2015 Treasure Hunt. The new PREMIER+™ is now available! For a limited time get 0% for 24 months on PREMIER+™ Ultra and Ultra Upgrade. *Offer applies only to single-receipt qualifying purchases. No interest will be charged on promo purchase and equal monthly payments are required equal to initial promo purchase amount divided equally by the number of months in promo period until promo is paid in full. The equal monthly payment will be rounded to the next highest whole dollar and may be higher than the minimum payment that would be required if the purchase was a non-promotional purchase. Regular account terms apply to non-promotional purchases. For new accounts: Purchase APR is 29.99%. Minimum Interest Charge is $2. Existing cardholders should see their credit card agreement for their applicable terms. Subject to credit approval. At Quilters Headquarters, we want to make your love of quilting not only fun but affordable. Our fabric is and always will be premium first quality 100% cotton fabric. We offer mostly blenders. Blenders are fabrics that are shades of one or two colors and "blend" well with other lines of fabrics. We carry an infinite rainbow of colors that will blend with any project you are working on. Unlike specific lines of fabric that are only printed once, blenders are often re-orderable. 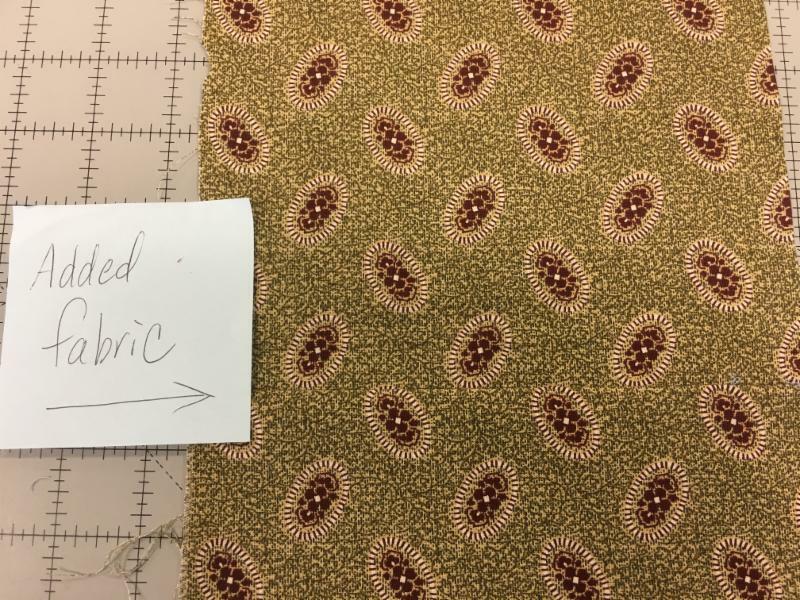 All of our 44"/45" fabrics will be $8/yard with a minimum one yard cut. We will maintain this price as long as the price of cotton doesn't jump again! 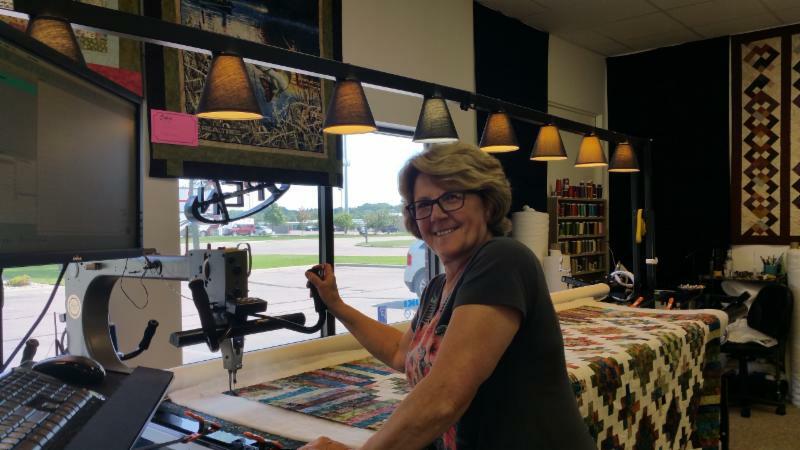 Jean is very busy quilting full time in the store. 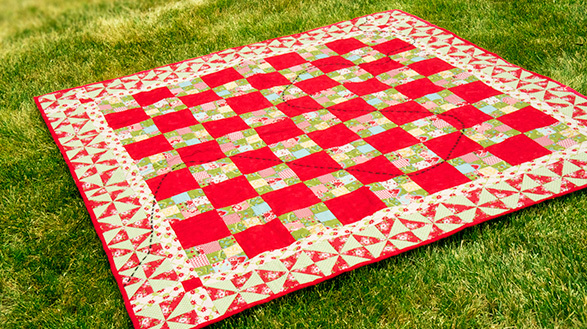 We're gearing up for the holiday rush so be sure to get your quilt in as early as possible. We are going to make a small change in our Mystery Quilt Reveal day. We had originally scheduled it as an open house in effort to try to accomodate everyone but that was a mistake. Everyone wants to see the quilts and share in the fun altogether so we will have our Mystery Quilt Reveal on Saturday, August 29 from 10:00 to 11:00. Come on in with your quilt, have some refreshments and we'll take a picture of your quilts to share with everyone. Even if its not quilted, still bring it on in. And we can quilt it for you too! If you can't make it at that time come in when you can and we'll take pictures and post to facebook. We have been working on our class schedule and we are doing something really exciting for our classes. Many of our classes will be designated as Cash Back Classes. A CBC class is one where you get your class project finished, either in class or at home, and bring it in to show us and we give you a $10 gift card just for getting you project finished! 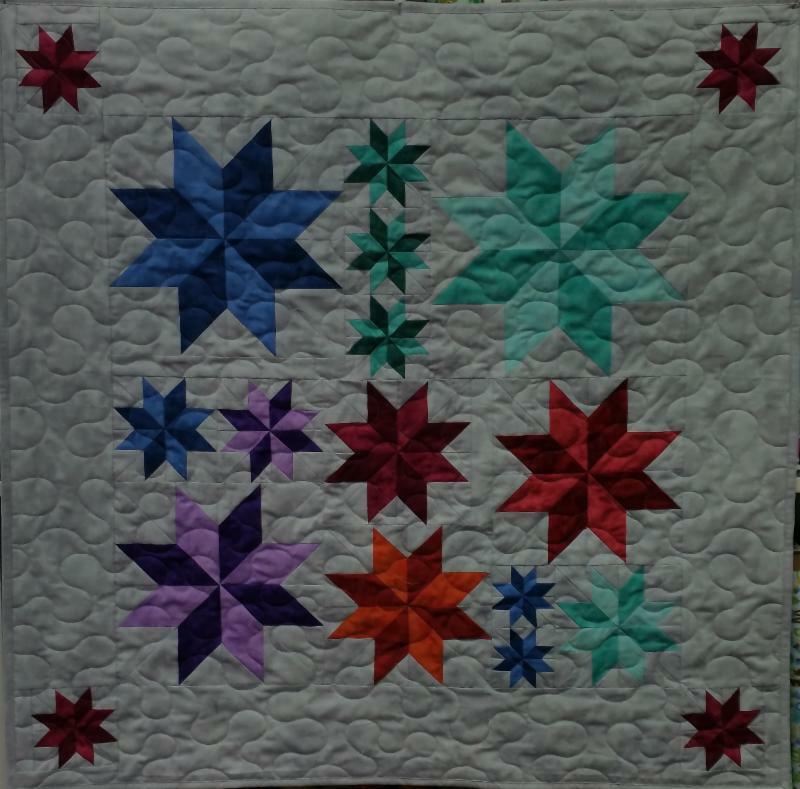 Among the soonest upcoming classes are the Lemoyne Star sampler , a binding class, and Bloomin Minds wall hangings . Too much fun. Be sure to check out the calendar. Our Beginning Quilt class is starting September 15. Please sign up early and bring a friend! Other classes on the horizon include a Sew Together Bag, Longarm Rental class, and DIME all coming up in September. The Row by Row shop hop continues until September 8 so you still have time to travel and pick up a few more rows. We stopped at various places along our trip as well and the most fun was visiting with other shop owners. Quilters are such nice people! 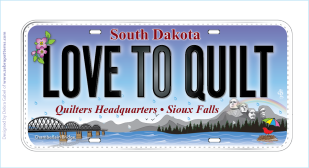 We re-ordered fabric license plates again so we have more coming. We have also joined the Fabshop on-line shop hop in September. You can find out more about it on our homepage. Receive gift valued at over $299 FREE for attending! 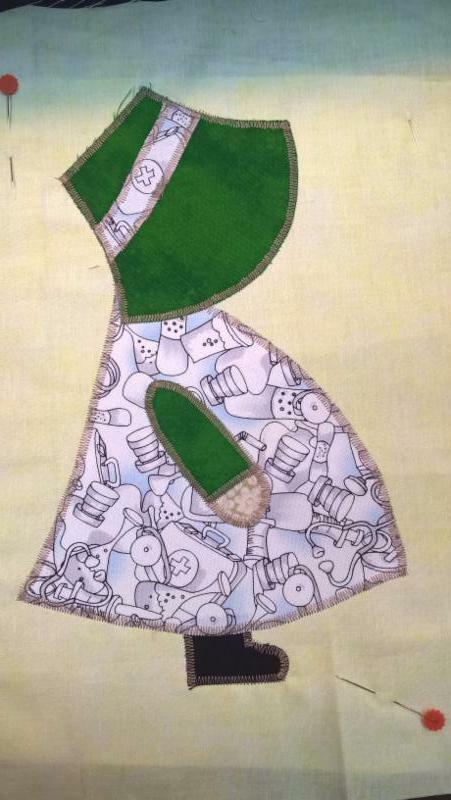 to attend before August 15, 2015 and receive DIME's Blanket Stitch Applique Alphabet FREE! This is a Cash Back Class - receive a $10 gift card when you finish your project! This is a Cash Back Class - receive a $20 gift card when you finish your project! This class meets for 5 weeks on Tuesday nights at 6:00. We will teach you the basics of making a quilt top and how to choose fabrics and colors. There are three things you need to master to make a good looking quilt top - cutting, sewing a quarter inch seam, and pressing. Sound easy? It is! Plus we teach you how to make at least 9 different blocks learning several basic techniques that will set you up for making almost any quilt that you can imagine. You will make one block in each class, and then using that technique again to make a similar block on your own as homework. We have several different kits to choose from which are included in the price of the class. A little note for beginners. 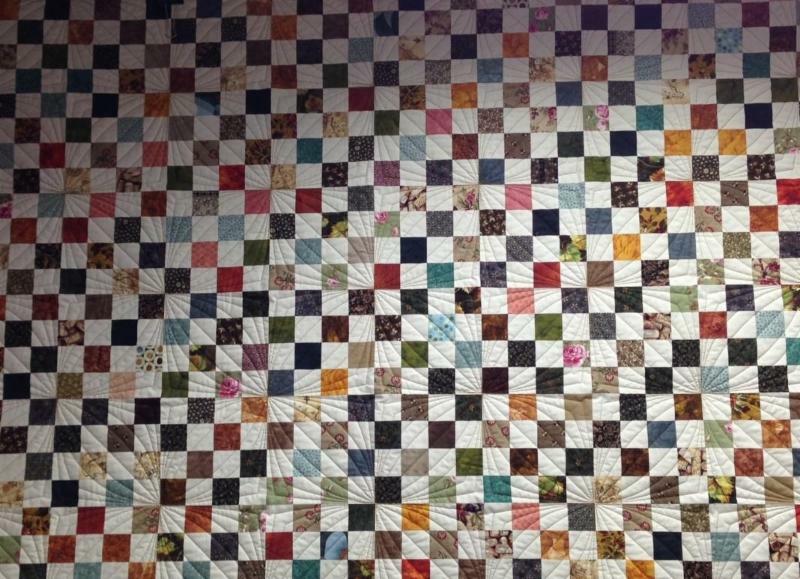 A quilt is made up of multiple layers. There are traditionally three layers in a quilt: quilt top, batting, and quilt back. The batting goes in the center of the quilt and gives it thickness and warmth. There are several different kinds of batting, ranging from 100% cotton to cotton blended with polyester, also wool, bamboo, and now they are making batting with recycled plastic bottles. The final layer of a quilt is the backing. Backing can be one solid piece or a pieced backing. Some quilters like to use up the remaining fabrics from the top and piece it together. If you are going to have your quilt finished on a long arm, the back needs to be larger than the top all the way around to allow for clamps and pinning on the longarm. The next step is actually quilting the three layers together. This involves stitching through all of the layers and creates some sort of design. This step gives the quilt texture and keeps the batting from coming apart. 2 1/4" or 2 1/2" This gives the quilt a nice finished edge. How about this... it's like a shop hop, but it's not... no fees, no passports and all summer to play! 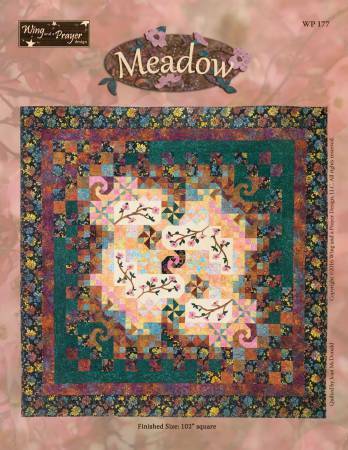 Simply visit any of the participating shops and receive a free pattern for a row in a quilt. Combine your rows in any way to create a unique quilt that represents the fun you had traveling throughout the summer. Travel with friends, discover new quilt shops and have fun collecting rows! Create a quilt using at least 8 different 2015 rows from 8 different 2015 participating RxR shops and be the first to bring it into a participating shop to win a stack of 25 fat quarters (6-1/4 yards of fabric!). Use that shop's row in your quilt and win a bonus prize! At Quilters Headquarters, we want to make your love of quilting not only fun but affordable. Our fabric is and always will be premium first quality 100% cotton fabric. We offer mostly blenders. Blenders are fabrics that are shades of one or two colors and "blend" well with other lines of fabrics. 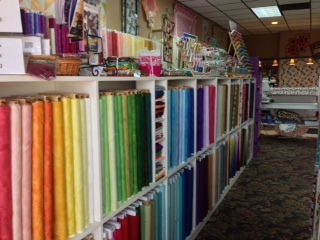 We carry an infinite rainbow of colors that will blend with any project you are working on. Unlike specific lines of fabric that are only printed once, blenders are often re-orderable. We are restocking our Michael Miller Krystal as well as bringing in other lines of blenders that we know you will love. 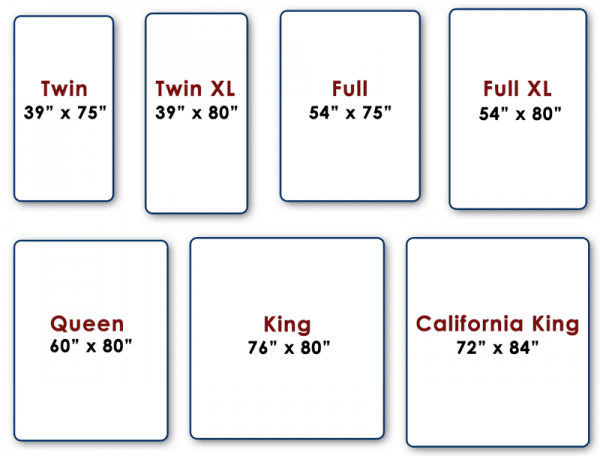 All of our 44"/45" fabrics will be $8/yard with a minimum one yard cut. We will maintain this price as long as the price of cotton doesn't jump again! I must apologize for not getting our newsletter out last week. The Row by Row shop hop has really kept us hoppin! I'm anxious to hear what the theme for next year will be. We are going to make a small change in our Mystery Quilt Reveal day. We had originally scheduled it as an open house in effort to try to accomodate everyone but that was a mistake. Everyone wants to see the quilts and share in the fun altogether so we will have our Mystery Quilt Reveal on Saturday, August 29 rrom 10:00 to 11:00. Come on in with your quilt, have some refreshments and we'll take picture of your quilts to share with everyone. Even if its not quilted, still bring it on in. And we can quilt it for you too! If you can't make it at that time come in when you can and we'll take pictures and post to facebook. Our Beginning Quilt class is starting September 15. Please sign up early and bring a friend! 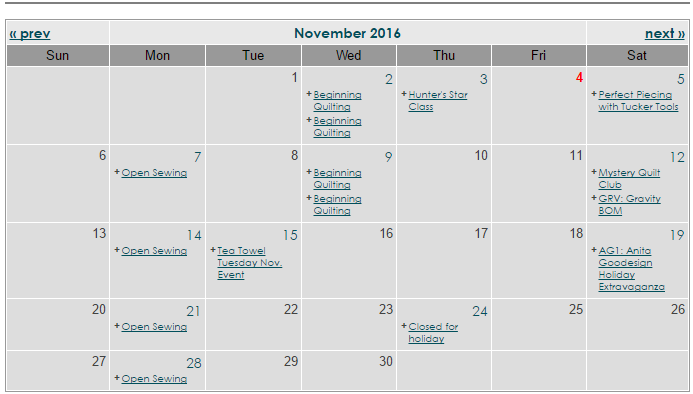 Other classes on the horizon include Binding, a Sew Together Bag, Longarm Rental class, and DIME all coming up in September. The Row by Row shop hop continues until September 8 so you still have time to travel and pick up a few more rows. We stopped at various places along our trip as well and the most fun was visiting with other shop owners. Quilters are such nice people! Unfortunately, we are sold out of our fabric plates. A hanging sleeve is a tube of fabric sewn to the back of your quilt at the top. To hang a quilt with a sleeve, just slide a rod of some sort through the tube. This is the method that quilt shows use when hanging quilts, but you can do the same thing at home by placing both ends of the rod on decorative brackets mounted on the wall. A hanging sleeve will allow your quilt to hang freely which will save it from getting pulled out of shape when it is displayed. Except in very small quilts, hanging sleeves are usually 5" or so deep. Here is how to make one. Cut an 11" wide strip of washed muslin to the width of the quilt. If you would like to make your sleeve invisible, use the same fabric as the backing. If you have fabric left over from the quilt, consider using that to make the hanging sleeve. Fold under the raw edges of both sides twice and stitch. That will enclose the raw ends in a seam and also makes the sleeve just slightly narrower than the quilt. If you have not yet bound your quilt, fold the sleeve in half the long way with wrong sides together. Pin the raw edges to the top edge of the quilt. As you sew the binding on your quilt, you will also attach one long side of the sleeve to the top of the quilt. When you fold over and stitch the binding, you will encase all the raw edges of the sleeve as well.If you have already bound the quilt, sew your sleeve together the long way with right sides together. Turn it inside out. Place the seamed edge of the sleeve just below the binding on the back of the quilt and whip stitch it to the backing. The raw seam will be inside the sleeve tube at the topSew the bottom part of the sleeve to only the backing with very long basting stitches. Don't flatten the sleeve completely when you sew it down - you want it to have a little bit of slack to accommodate the rod that will go through it. July 2015 - Free Sewing Project - Ants, Welcome Quilt! Summer has arrived, and it's the perfect time for a picnic. So while the pinwheels are spinning and the sun is shining, pack a basket full of goodies, grab your favorite friends, and head on out. But don't forget your blanket and the smallest of picnic friends. Yes, the ants have arrived, and they would just love to join you for the feast and the fun.